Don't get caught without a moose guard, deer guard, herd grill guard, bumper grill guard, front grill guard or whatever nickname you have for it! 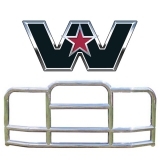 Having a chrome grill guard equipped to your truck can save you time and money in the case of an accident or collision, and add a clean, aggressive look. With a rig guard installed, you greatly decrease the risk of your truck being down and having to visit the shop for repairs — and anyone in this industry knows that if your truck is down, you really are not making money. 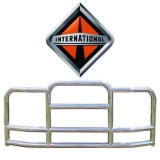 Replacing a bumper, lights, grill and hood is expensive no matter how you look at it, but with a semi truck grill guard you can protect these parts of your rig. 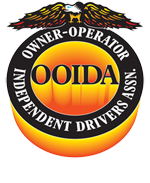 We sell directly to independent drivers as well as large company fleets at better prices and with better service than anyone else in the industry. Shop our great selection from top brands like Ali Arc, Herd, and more! Give us a call if you are looking to make a large purchase and we can offer tier discounts. Also, be sure to take advantage of our free shipping offers. Don’t tempt fate by driving without a chrome grill guard. A grill guard is a bit of an investment, but nothing like the cost of major front-end bodywork — or the amount of time you’ll have to spend idling while your vehicle is being repaired. Can’t find it at Raney’s? Chances are you can’t find it anywhere. 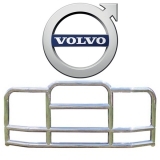 Selecting the right grill guard for your semi truck can be tricky. If you aren’t sure which item will work with your cab, contact our experienced customer service team — we will help you verify if the item you’re interested in will fit, and if not, identify mountable grill guard options. All bumper guards are not the same. Differences in design and materials have an impact on the guard’s strength and ability to withstand impact. 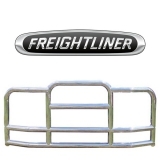 In certain areas, such as where animals are commonly found on the road, a high-performance “herd grill guard” like the Freightliner Defender is a great choice. For areas where driving conditions are less challenging, other options may be more economical and practical. 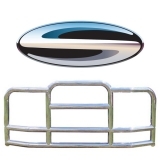 Again, if you are not sure what level of bumper guard performance you need, give us a call. We can help you work through the product specifications to arrive at the product that best fits your needs and budget. That is exactly what Raney’s sales team is here for. 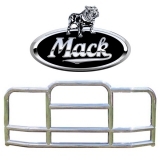 Make Raney’s your go-to shopping destination for front grill guards. We have a huge inventory and many items are available for immediate shipment. You will find that your orders are always packaged with extreme care to minimize the possibility of damage, and that our products always work as advertised. Take advantage of our “Chrome Convoy” rewards system to earn points when you shop at Raney’s. Your points can be used for special offers and free products — contact our sales team to learn more.